Botryosphaeria dothidea is an important pathogenic fungus that causes serious diseases in fruits and trunks of many wood plant species worldwide. In this study, 28 B. dothidea strains isolated from pear trunk samples showing stem wart or canker symptoms were used to detect double-stranded RNA (dsRNA) viruses. The dsRNA bands with the size of ~ 1.0 to ~ 6.0 kbp were examined from ten strains. Here, we reported a novel dsRNA mycovirus, tentatively named as Botryosphaeria dothidea victorivirus 2 (BdVV2), isolated from the B. dothidea strain MSD53. BdVV2 contained spherical virions that were ~ 38 nm in diameter consisting of a single linear dsRNA genome of 5,090 bp in length. The BdVV2 genome contained two overlapping open reading frames (ORFs) encoding a putative coat protein (CP) and an RNA-dependent RNA polymerase (RdRp), which shared significant amino acid identities of 68% and 60% with the corresponding proteins of Sphaeropsis sapinea RNA viruses 1 (SsRV1). 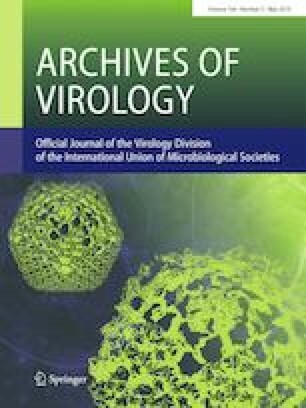 Phylogenetic analyses based on the aa sequences of CP and RdRp both showed that BdVV2 was phylogenetically related to the members of the genus Victorivirus in the family Totiviridae. BdVV2 is thus a novel victorivirus isolated from the phytopathogenic fungus B. dothidea. Handling Editor: Robert H. A. Coutts. This work was financially supported by the earmarked fund for Pear Modern Agro-Industry Technology Research System (CARS-28-15) of the Chinese Ministry of Agriculture and the Fundamental Research Funds for the Central Universities (no. 2662016PY107). No human or animal ethics approval was required for the completion of this study.